The World Wide Web world is not the same anymore and to be able to achieve effective outcomes, every kind of business should be up to date with the latest trends. To make it to the top of the search engine results, your site needs to be well-structured and designed as per the essential SEO requirements, and with these simple to follow techniques you can improve the visibility of your web pages for different search engines and make them more search engine friendly. USER EXPERIENCE: Site should have an easy to use navigation and clear call to actions and it’s important for it to be accessible on all browsers & devices. And not to forget mobile compatibility – that’s the most crucial factor! 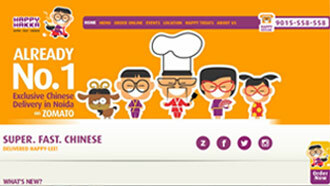 We have partnered with Happy Hakka to design & develop a website that is an extension of the brand’s idea of delivering a quick, smart and hassle free experience. The website is extremely user friendly and regardless of being directed to a separate tab for placing the order, the process is easy and fast. The site was further modified & incorporated with a conversion & traffic optimizing approach to encourage call to action, which was missing initially. Overall, despite being a challenging project our team was able to achieve the desired results within 6 months! ARCHITECTURE: Search engines crawling on the site should be enhanced and important content should be managed well. Furthermore it is recommended to avoid duplicates in content, format URLs & include important keywords in URLs. But most importantly, the architecture should be compatible with mobile devices. 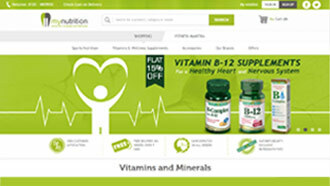 MY Nutrition is a highly scalable and responsive web store. On being modified by our team there was a 40% increase in conversion rate. The site was modified & incorporated with a strong citation and website navigation. The modified version boasts of an amazing user interface, great loading speed & the content is well sufficed with essential keywords. And with a further addition of an informative blog ‘Fitness Mantra’ there was a 35% increase in the user engagement. HTML: Title tags are highly critical in SEO & it’s essential for the headers and sub headers to be mentioned and well categorized. Likewise, the data should be well structured and Meta descriptions should be built-in to provide snippets to various search engines. SPEED: A website that loads slowly may not gather the same results as one that loads fairly fast. The speed can be improved by including small amounts of database calls when necessary. Additionally, optimizing images for all devices & using Content Delivery Network (CDN) is highly recommended. SOCIAL MEDIA: Manage and optimize social media rich snippet tags and make sure the content is authentic & readily shareable on each channel. Sharing engaging content on social media is a great way to maintain brand’s social standing and build on first time visitors’ trust. • Estimates say that in 2015, there will be as many as 50 billion local searches using mobile devices—wouldn’t you want to be found in those searches?